Powered by the inimitable bow of Irish fiddle great Kevin Burke, Second Story defines Open House as a leading architect on the Celtic/American music frontier. With acclaimed country and bluegrass musician Tim O’Brien producing, the new album is a sparkling set of Irish fiddle tunes, Balkan melodies, French bourrées, and American old-time music. Second Story also showcases the hilarious, inventive songs of Mark Graham, and even the vocal debut of Kevin himself! 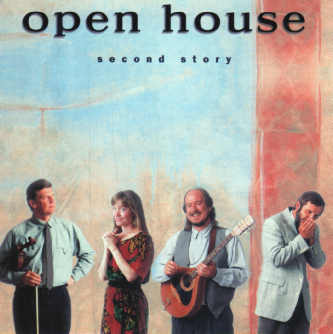 Open House is a tight musical enclave defined by fiery instrumental music, dance, and song. Accented by the virtuoso instrumental work of Paul Kotapish and Graham, and the unique rhythms of Sandy Silva’s dazzling footwork, Second Story delivers a wonderful blend of music from around the world.